Thanks to the lovely local grocer I have a boat load of Golden Queen peaches to deal to. Like 7kgs worth and no jars to make jam. But hell , one cannot say no to such a bounty of fruit for under two bucks! So instead of jam I made dessert. I stumbled upon a most amaze recipe at www.canadianliving.com and threw it all in the oven. So good! Definitely give this one a go if you find yourself endowed with millions of peaches. I had some broken pastry sheets to use up so I pressed those into my deep casserole dish to make a jumbo pie. I didn’t quite have enough pastry for the lid of my second pie so I topped it with crumble mix instead. A hybrid of sorts! Line 9-inch (23 cm) pie plate with pastry. In large bowl, combine peaches, sugar, flour, lemon juice and candied ginger. Fill pastry shell with peach mixture; dot filling with butter. Moisten edges of bottom crust. Cover with top crust. Trim and flute edges. Cut steam vents. Brush top with milk or cream; sprinkle lightly with granulated sugar. 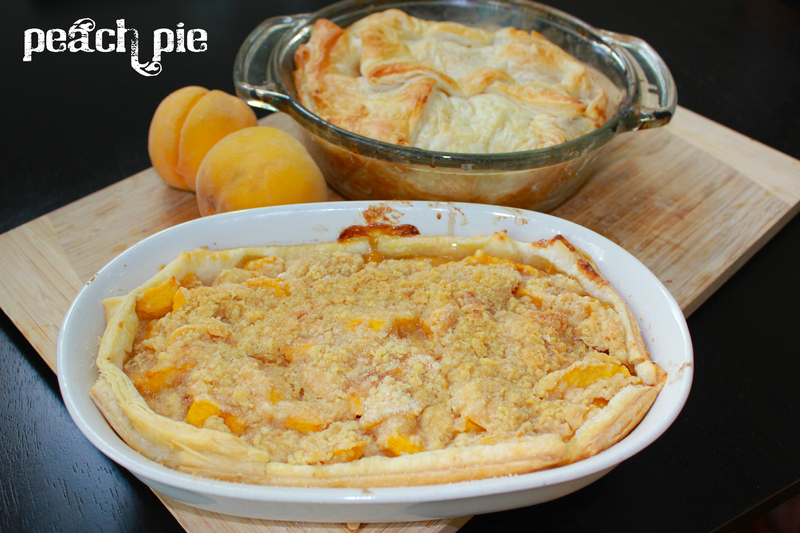 Bake in 425°F (220°C) in bottom third of oven for 15 minutes; reduce heat to 350°F (180°C) and bake for 35 to 45 minutes longer or until peaches are tender, filling thickened and crust golden.